It wasn’t enough that I got a TON of birthday wishes via email, blog comments, and my very own threads at the Knittyboard and Ravelry, but I also got lovely thoughtful gifts. While I was at my regular Thursday knitting meetup today, the lovely (although blogless) Kathy gave me a huge box of assorted teas – I totally didn’t expect that, and it was so sweet of her! I will smile every time I have a cup. My very own “So Long and Thanks for All the Fish”-themed Adjustable Row Counter (available at her Etsy shop. VERY cool tools.) 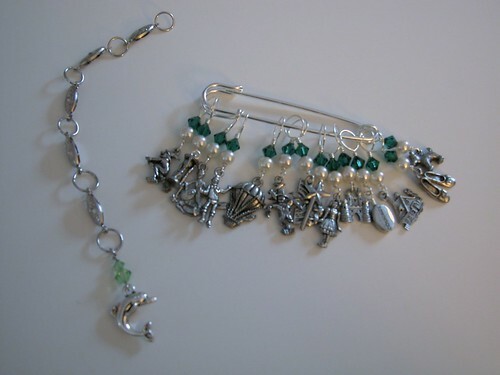 and on the shawl pin, a set of 14 WIZARD OF OZ STITCH MARKERS!!! Wanna see them all? And you can actually put some of them on the pin to wear that way, too!Â What a cool idea!Â I am so in love with them – the next row I do on Charlotte’s Web, I am switching so that these are all on the shawl, as well as the row counter. Thank you, my dear friend.Â I am a lucky, lucky woman to have so many amazing people in my life. I’m feeling clueless – what’s the one that looks like a chinese symbol? How perfect for you are those stitch markers! That is knitty sister love!! What a perfect birthday present! Hope your birthday was fabulous! Wonderful gifts for a wonderful woman! What wonderful gifts! The one from me won’t be quite as exciting, and I’m sorry it’s been delayed… didn’t think to send it with mom. 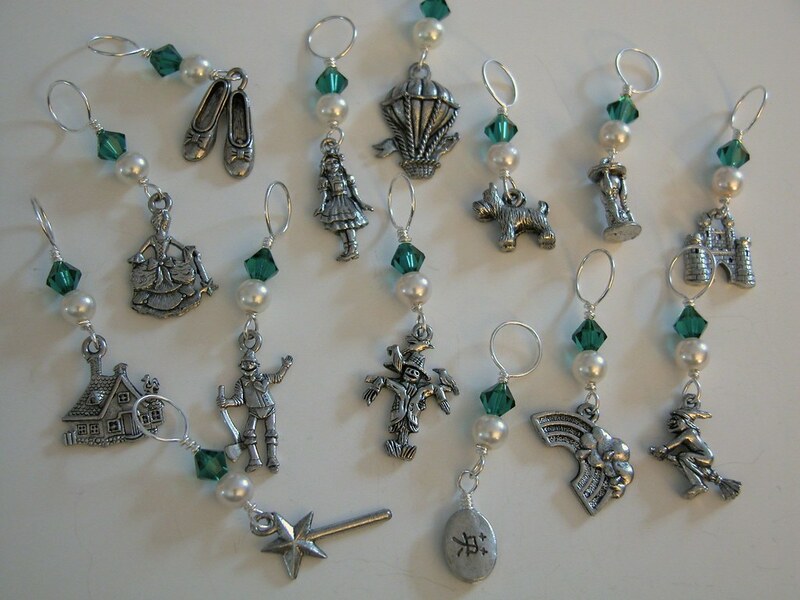 Oh my god, those stitch markers are adorable! And I usually don’t go ga-ga over stitch markers ;). And a happy birthday to you, because I can’t remember if I said it anywhere else! Too freaking cool! I’m not a WoO fan, but I’m a sucker for a good themed-anything and that rowcounter and markers rock!!! yeah, the fat witch bakery rules! enjoy the yummies. Mmmm, great trinkets too. I resist even going over to Etsy. There’s too much stuff over there that I need. I knitted with you Thursday and forget to say Happy Birthday in person. Here’s to many more blessed years of living and of course, knitting! Aww, you didn’t have to post just about those. How sweet of you. =) I’m just glad they got there and weren’t lost in the mail. And for the record, I put them in the mail on Tuesday at work and they SHOULD have gone out that day. I’m rather upset to hear they had a Wednesday stamp. Dammit. awesome! you’re a lucky girl to have so many great friends!